Jane Austen in the den. And so the spoofed nursery rhyme speaks of a tale of five Austen soul sisters who were all Macfadyen-ed by the end of a 27-hour journey. In my get-togethers with this circle of friends, the talk about having movie/TV series marathons was mentioned several times. And in one of those talks, Pride & Prejudice became one of the choices given its number of adaptations: from Laurence Olivier's version to this modern-day take. I came into this marathon knowing that I'm going to be absolutely sleep-deprived but throughly excited at the prospect of watching different adaptations with friends. As you may see from this twitter hashtag, we had tons of fun and fangirl squeals. Towards the end of the marathon -- wherein we were re-watching P&P 2005 with commentary -- I mused of the fact that there were five of us in the den, much like there were five Bennet sisters. So I posed the thought as to who's who. 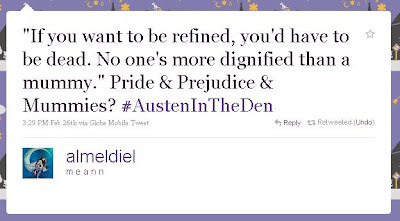 I ended up being Jane Bennet since age became the main parameter. 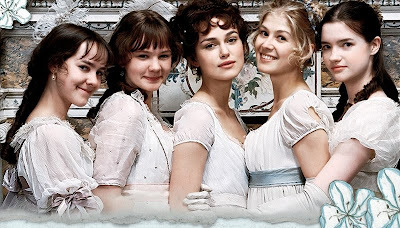 The longer I contemplate about the characteristics of each Bennet sister, I think it matched to a good extent as Jane was the one I could relate to the most.